My unopened KRE-O G.I. Joe ‘Outpost Defense’ set. I’ve been a little torn on this. Picked up this KRE-O G.I. Joe set about a year ago. 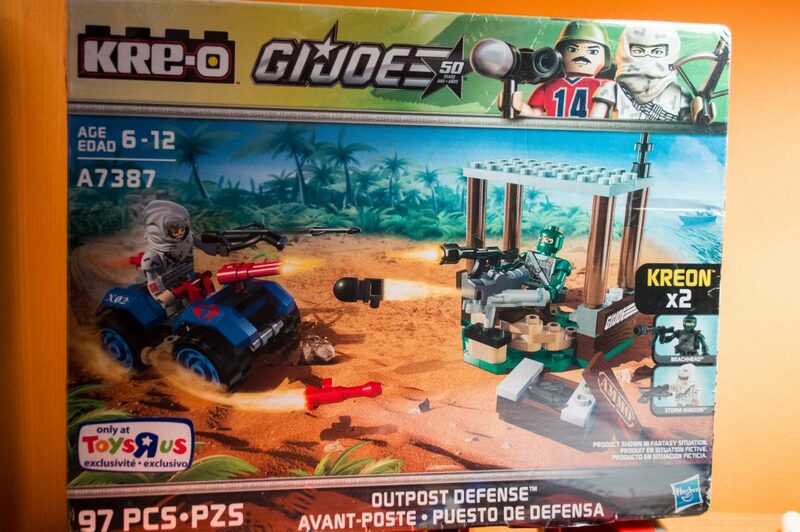 It’s the “Outpost Defense” set featuring Beachhead and Storm Shadow. I think it’s pretty cool, but just am not certain if I should actually open it. We’d been looking to move back when I first bought it. Was just a chance encounter, I found it along on a shelf at a Toys’R’Us on sale for about $7, so I grabbed it. But I hadn’t wanted to open it then because I figured best to leave it boxed so it would be easier to take in the move. Now that we’re settled in our new house, I have the box just sitting there. So, I’m debating it. Do I open it? Do I leave it closed up and sealed? I haven’t even touched the plastic wrap. For now, probably going to keep it pristine. Don’t really know where I’d set it up even if I did open the box. Not sure if there’d really end up being some kind of value to it.